Fiction – paperback; John Murray Originals; 192 pages; 2015. Review copy courtesy of the publisher. Solitude and loneliness are common threads that run throughout the 12 short stories in this collection, by debut author Jessie Greengrass, which has recently been shortlisted for the 2016 The Sunday Times/Peters Fraser & Dunlop Young Writer of the Year Award. The self-titled story, An Account of the Decline of the Great Auk, According to One Who Saw It, sets the scene for all that follows, for each tale is written in the same precise, almost cold, but always elegant style with nary an adjective to be seen. There’s a certain kind of melancholia at work here — and a clarity that defies the often convoluted sentence structure. Yet the subject matter varies wildly from story to story and even the time periods swing between past, present and future. Nothing feels predictable and starting each new story feels like going on an unexpected adventure into unexplored territory: you’re never sure where it’s going to take you. And yet, despite the characters being (mainly) nameless (sometimes we don’t even know their gender, nor their age), it’s easy to identify with them, to empathise with their circumstances, their predicaments, their successes and their failures. Everything feels deeply personal, if somewhat quirky. … they were clumsy, they waddled, their walk was ungainly; they swayed and rolled as they struggled to put one flat foot upon the rock in front of the other and often they fell over. We caught them up and pulled the feathers that we needed and then let them go half-plucked and even then they would not run but only stand bemused and blinking and naked where we put them. And then later they would die of their own accord. Humour is well used in the story All the Other Jobs, too. In this short tale a discontented narrator, paralysed by indecision, dreams of running away and leading a new, more productive life. Who doesn’t recognise this kind of thoroughly modern 21st century behaviour? I spent a lot of time on the internet, cycling through a set series of websites, letting my eyes drift down one page and then another without any effort to read or absorb, past even passive consumption. I found this so comforting. Hours would recede in the clicking of links without me retaining any clear impression of what I had been looking at. It was a kind of abnegation, a loss of self in the expectation of each loading page, the small reward of its arrival after the brief wait so much more satisfying than any of the information it might contain. We were told that when an intrusion was entering the active phase of its cycle the first thing we would notice would be that things would feel colder. Not just the temperature but the world itself: we would feel that the world had become colder, that something had been stripped away from it, some quality of receptiveness or responsiveness which had previously made it home. The feeling would bloom slowly from unease into fear. 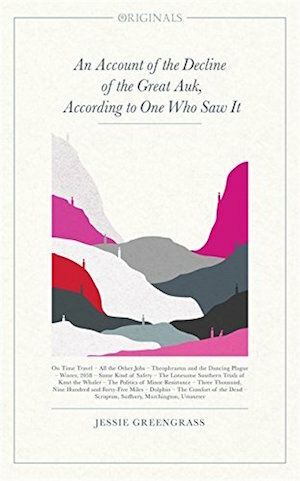 This eerie story of displacement, of the unknowable power of nature, of a bid to make sense of something unexplained is wholly mesmirising from start to finish. You become immersed in a kind of supernatural fairytale in which nothing quite makes sense and it leaves you with a deep sense of dread. I suspect it’s a metaphor for learning that no matter how many friends and family we might have we’re born alone, we live alone, we die alone. How deep is that? As you might have guessed, I was very much impressed by this tantalising collection of odd, often quirky, tales. There’s a deeply philosophical bent to them, perhaps no surprise given the author studied philosophy, and richly humane, filled with ordinary people caught up in extraordinary circumstances. They’re also hugely imaginative and quite unlike anything I’ve read before. More please. This collection sounds worth getting just for ‘Winter, 2058’ alone!